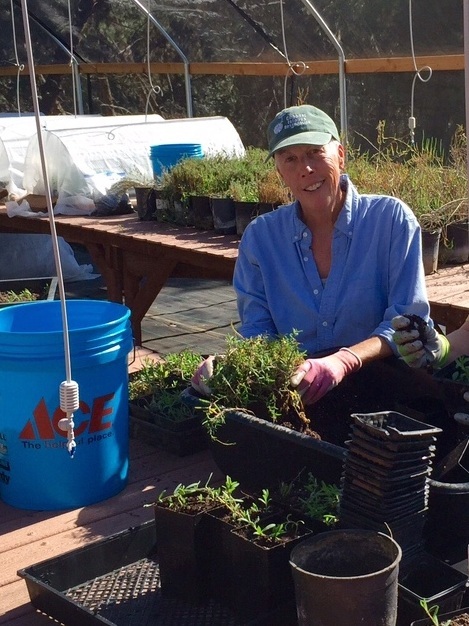 We sat down with Nursery Manager Kelle Green to ask her about her work at CIR - how she became such a great gardener, how she joined CIR, what her favorite plant is, and more! So how did you first get involved with Channel Island Restoration? Well, I have been volunteering with the Park Services on the Channel Islands for quite a while and in doing that I worked with CIR volunteers. I would do the propagation and they would do the installation. Around when did you start doing that? So when did you go from volunteer to nursery manager? I was out on a volunteer trip to San Nicolas. I knew Ken and Kevin because we’ve all worked quite a bit together. I was talking to Ken and he knew what I’d been doing for Park Service and I said, “Whenever you’re ready you really need to hire me to manage your nursery on San Nic.” And he goes, “Well guess what? We need somebody!” And so then I was hired. Oh! That worked smoothly. Did anything change after you got hired? The Navy wasn’t so happy that CIR hired a volunteer to do the nursery. A lot of people don’t really know what to think of volunteers. But volunteers are really dedicated, pretty smart, have pretty damn good careers and like to give back. I never underestimate volunteers. Then, I heard the Navy had an opinion about me but it changed and we work closely together now. That’s good! What exactly do you do as a Nursery Manager? When there is a project in which we are growing plants and it involves removal and restoration — restoring a site with natives — that’s where we come in. We are more usual now because we have a mainland nursery. So not only do we do habitat restoration but we also grow the plant, which means we can grow plants that are genetically appropriate for an area. We can collect the seeds and grow them instead of buying a native from a grower. Where did you gain experience with nurseries? Well I’ve always had an interest in plants and growing and doing things like that, but it was just a hobby before. Then when I retired from my design business I got involved with the Master Gardener Program for Ventura County. I started to get into the science of growing and agriculture. Can you tell me more about what you do on the islands with your volunteers? If I’m just doing nursery work, I have eight people (seven plus me). The work leaders go out and collect seed with me. I can leave them on site and they know what to do. It’s collecting, cleaning, storing, recording then propagation and transflighting and keeping it alive then babysitting. You keep your fingers crossed that your plants, if their scheduled for a November install, will actually happen. What does happen many times is that projects get delayed for various reasons, like weather conditions. You have to keep the plants going. But plants do not like being in a pot, they want to get out and go on the ground. Every year I get faster and better, and we become more efficient. And the volunteers, I mean there’s just a whole bunch of them there and it’s absolutely great. They are great people to work with. It makes it a really sweet job. When you are working on a project, how often would you say you are going out to the channel islands and how long do you stay. When we are on a project we are in the nursery twice a week. Kelle Green, CIR’s Nursery Manager working with plants in her nursery. Can you tell me more about the Pipeline Project you did - the three mile roadside erosion control - and what the connection was there with the channel island fox? Basically it’s the most physical project we have ever done on the island San Nic, and probably one of the most physical projects period. It’s not off in a canyon or down at a beach or lagoon where people can’t see it. This is all on a road side where everyone sees it. And on San Nic you have vehicles and foxes. Foxes aren’t car savvy at all. So, the back rows will be shrubs which will provide protection to other plants. But we can’t have tall plants towards the road because the foxes can’t be seen. So we had to be able to put plants in that could be mowed or driven on, or that could be wacked down so that we can see the foxes. That was really important criteria. That sounds like quite a puzzle! Right. And your choices of plants are very limited. Some of the islands have a much larger choice of natives. San Nic’s palet is just not as big as other islands, but we were able to do it and it looks really good! You’ve done a lot of work on San Nic, is it your favorite island? It didn’t used to be. I used to think it was a hassle being with the Navy and on the base. And I absolutely love Santa Rosa, there is no comparison between the islands. But, San Nic really grows on you. Yes, yes its flat but it has its own personality and the people there are really great. They are quirky, some have been out there for over 25 years! Santa Rosa is so different, so diverse. So those would be my two favorites. Which was the first island you had ever been on? I didn’t start going on the Channel Islands till about 2011, 2012, so it was somewhere in there. And just out of curiosity, what is your favorite plant? Oh… I don’t know. I used to always say Shasta daisies and roses. I do really like the buckwheat, the whole family of buckwheat, I think they are amazing plants. They are a great food source, they are beautiful plants, and they are very generous plants. But I also love the salvias like purple sage and black sage. Those I would say are some of my favorites. Hopefully the same thing! As long as there are projects and they want me to grow, well even if they didn’t, I probably would still do it. I like installing, I like going out and leading. I like all that stuff. So I enjoy it a lot! Awesome! Thank you so much for talking with me!